Mmmmm, cute and smart! Nice! Did you ever dream of being locked in a candy shop overnight? Thinking about what you’d eat first, maybe even making a mental list incase your delicious dream ever came true. 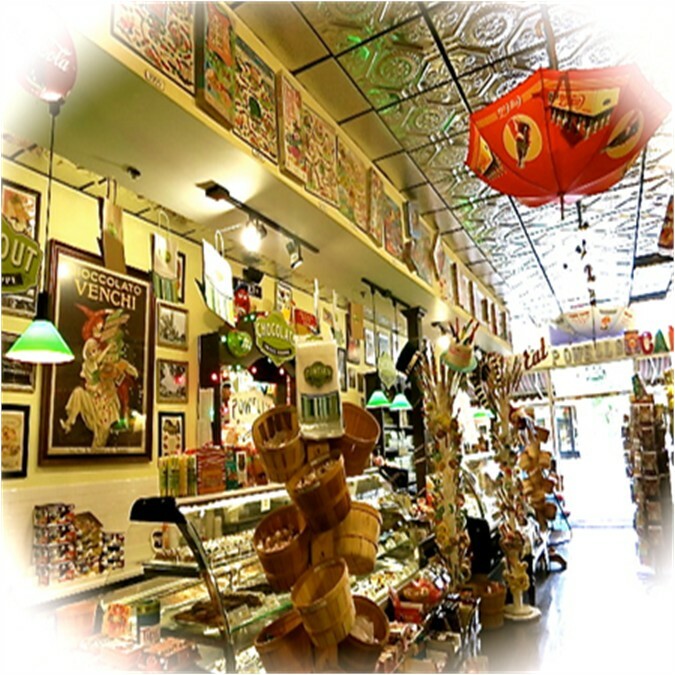 You’d be lucky if it was Powell’s Sweet Shoppe in San Jose, California. Our lovely Alys took me there while I was visiting her in San Jose. Powell’s Sweet Shoppe is your one shop stop back to your childhood. Step in their door and you’ll immediately be saying “hey, I used to love those!”. 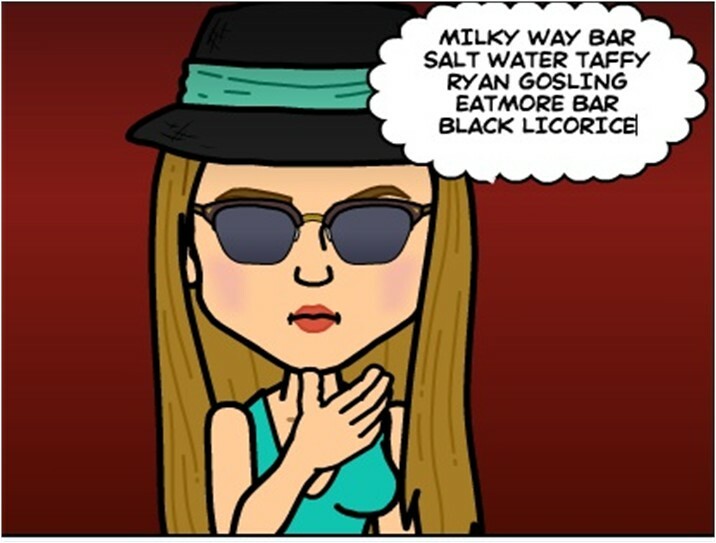 My other favourite, hands down, is Salt Water Taffy. I always have a hard time deciding what flavour to get. Alys actually gifted me a whole bunch of salt water taffy when I was leaving San Jose (in tears) but I ate it all before I got home, LOL. It was too yummy and I couldn’t stop. Thanks Alys, mwaaaaa! When I came across these little gems, I was a little shocked. I actually thought they had gone by way of the dodo bird. If you’re under 25, you might not even know what they are. This sweet treat might be politically incorrect but I couldn’t resist buying a package for old-time sake. Do I see a Mad Men Halloween custom in my future? It’s pretty hard not to go crazy in here. While we were shopping around, something magical happened. My hero Mary Poppins started to play on their theatre monitor. The day was practically perfect in every way. Mary, our sweet Alys and a spoon full of sugar. What was your favourite candy as a kid? Boom Box Four – I Love It Here! I’m not a sweets guy but inevitably when people would come see me when I lived in the Bay Area, one of the places they wanted to go was Powell’s Sweet Shoppe. I do believe it’s the best in the nation! I only wish we had one around here. 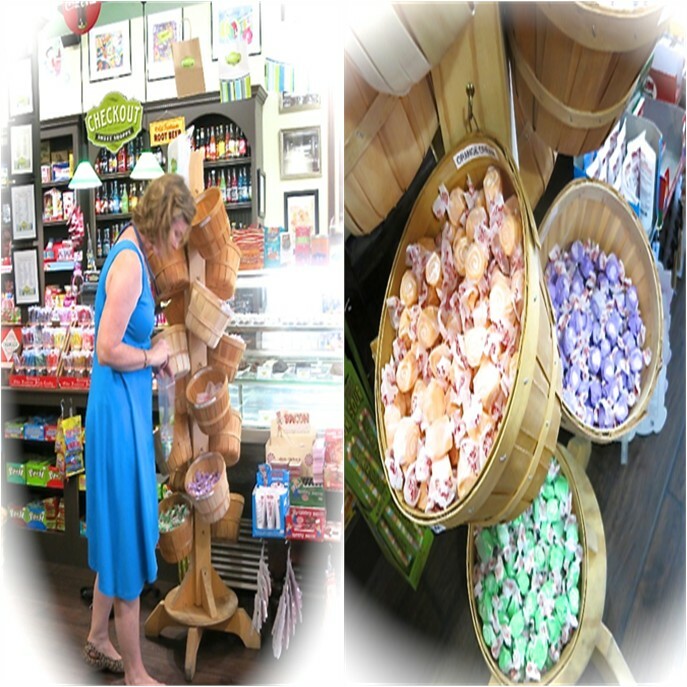 I’m not a giant sweets person but really loved the salt water taffy and all the vintage stuff they sell. I bet it’s awesome at Christmas. “Practically Perfect In Every Way!”. Oh no, I hadn’t read that book. I will promptly look her up, thank you. You and Sarah would surely love Powell’s. It’s stocked to the brim with nostalgia. They sell both treats and bric-a-brac to remind us of our youth. What a diabolical marketing scheme! Who could resist? Most candy in Mexico is hot and spicy! Takes some getting used to… or in my case, is impossible to get used to. 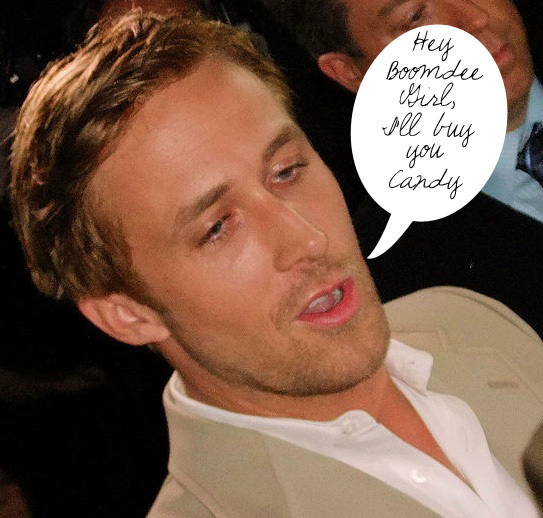 I loved looking at all the photos of your candy shopping adventure… my mouth is watering! Black licorice cats are my very VERY favorite, malt balls rank up there pretty high and then old english toffee (the one in the plaid box you have to smash with a hammer!) … ohhhhh I can’t wait to get home this summer and have some candy! Happy wednesday to you Boomdee! San Jose sounds awesome and the candy store looks fantastic–but I can’t believe that they still make candy cigarettes. I thought they’d outlawed them or something. San Jose sounds awesome, and the candy store is fantastic. But, I can’t believe they still make candy cigarettes. I thought that they’d outlawed them or something. My favorite candies where I was a child were Almonds Joys and Fifth Avenue bars. San Jose is such a nice community with cute shops and gorgeous neighbourhoods. Everyone’s yards are a page out of Better Homes & Gardens. Alys took me to a really cute scrapbook shop and I also discovered Falafels. I can’t seem to get organized at home here but I will share more of our trip soon. Fabulous!! Now, you’ve made me crave sugar. Not that it’s very hard to do…..I loved SweetTarts as a kid, remember those? So sugary sweet, but also had a sour tartness to them. 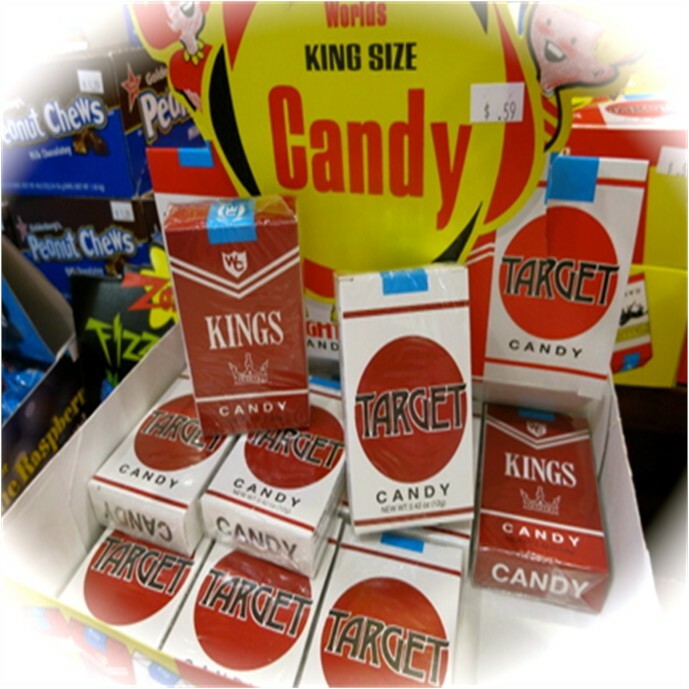 Candy cigarettes! That brings back memories, for sure. I always like Milky Ways. Lately I’ve been getting into sea salt caramels. I could go crazy in that candy shop! I had to come back again, and tell you how much JOY you bring me with your comments on my blog. I really needed it this weekend and I thank you my friend!!! Extra blessings sent to you this weekend. Why, it’s almost good enough to eat. The day was great fun. I look so skinny in your pic. May I know your special trick? Salt Water Taffy, just like you. PS, there’s no tricks by the photographer, YOU ARE THAT GORGEOUS! And thank you for that over the top compliment. 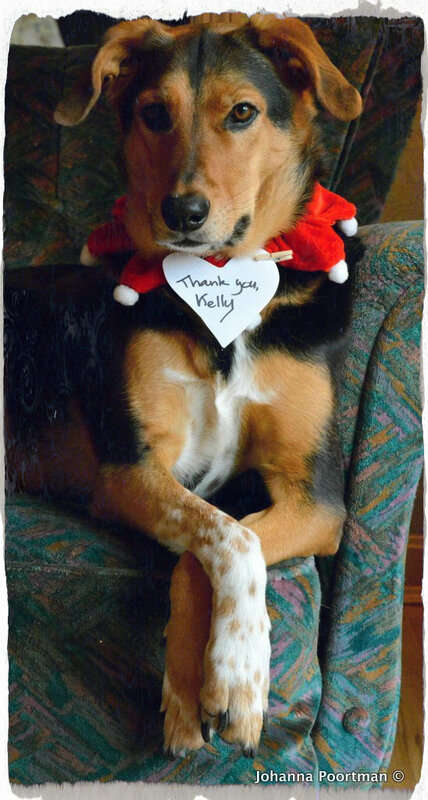 Blushing…. Believe it or not, I am not a sweets fan, but what a fun post to read and I’m quite sure I’d have something delicious in that shoppe. I used to love those fake cigarettes as a little girl – guess I thought it was cool. 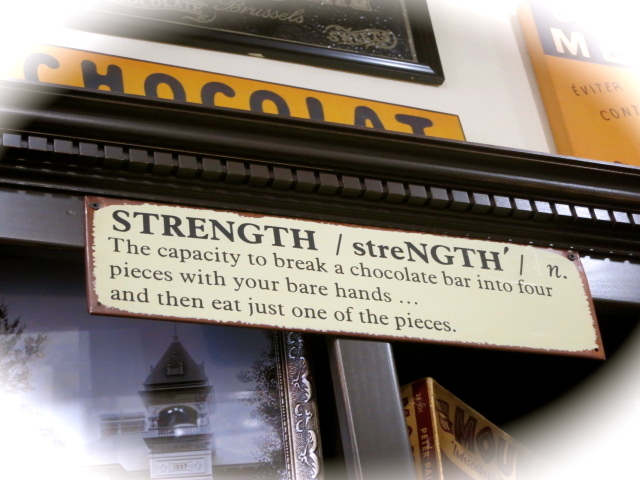 Love the Strength sign! Now … a wine / cheese store … outamyway!!!! I used to rarely eat sweets as a kid, we just didn’t have that much around except for a treat from my Grandpa. 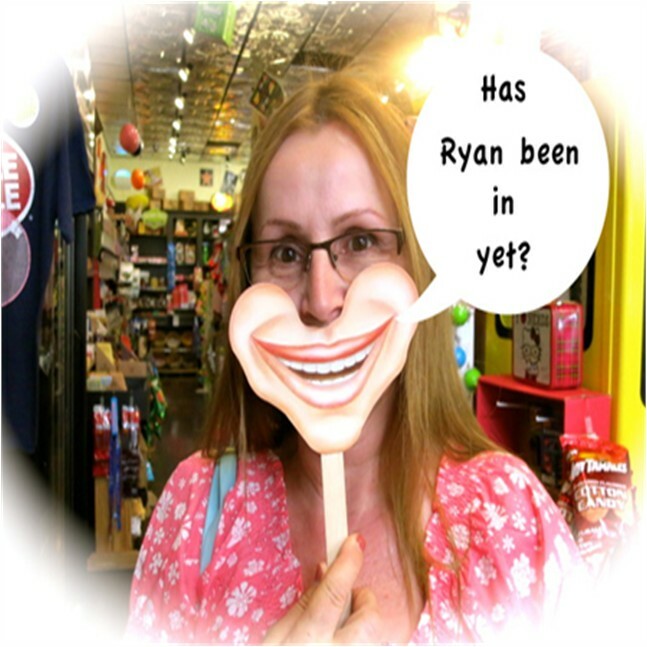 That’s why I liked Ryan’s quote because it was so true for me. It’s funny what past as kosher in days gone by, no one really thought anything inappropriate about buying you kids ‘candy cigarettes’, much to the joy of the tobacco companies I’m sure. Golly, that looks like fun….or torture. I’d have a really hard time resisting in there. My favorite was the little waffle cones with the marshmellow top that looked like ice cream. Haven’t seen those in more years than I care to count. I would probably require a 12 step intervention to get me out of that place. 🙂 What a joy to experience and thanks for the recipe. I remember those Marlene, you’re right, I haven’t seen those in decades. There was this lady next door when I was growing up, she’d send us to the store for her cigarettes (different times,ha) and give us a quarter to spend on ourselves. This little store had a whole section of penny candy and I remember buying those. Now, they id for 18 if you are asking to buy smokes in Canada. It’s also illegal to display cigarettes in our stores, you don’t even see them anymore. I just noticed on our trip that it was so weird to see cigarettes in stores there. That’s fascinating. I wish we would go that route. I remember buying cigarettes for my mom too before she quit. My times have changed. Also, pharmacies don’t usually get a license to sell cigarettes since they are sometimes considered a health care provider. Can’t be a health provider and profiting from both the health care system and tobacco sales. I’m always surprised to see young people smoking because I wonder who bought them for them. That sure makes sense to me! I agree, it seems so strange to see a young person light up. Such pretty taffy. I love the idea of taffy, and yet I rarely think to pick it out amongst the Raisinets and Junior Mints. I also love anything gummy!! OH ya! Gummy rocks. I bake a cookie at Xmas that has Raisinets in them. They’re like a shortbread and you use Raisinets instead of Chocolate chips….mmmmmm. I’ve actually seen someone on Pinterest with a Salt Water Taffy recipe, it looked like tooooo much work but maybe a good experiment for a post, mmmmmm do I dare? That was magic! I have been in there a ton of times with the girls and the only movie ever playing is Willy Wonka & the Chocolate Factory-must have been your Boomdee magic! REALLY? That just makes it all the more magical. That’s so funny Betsy. Alys and I started to sing along with Mary P….La la la…medicine go down 😀 She sings soooooo much better than I, LOL. Now that you mention it, Willy Wonka was on the monitor when we started shopping…Kismet I guess. I also bought a candy that says “I blogged your mama” cause it made me laugh. What a fun day! Sorry you missed joining us, Bets. My boys love it in there. I usually buy them Powell’s gift certificates for their stockings so they can go pick out what they like. I noticed when I was looking for their link for this post that there’s a few of them around. One in Los Gatos too. I wish we had one here, they had cool vintage nic-nac’s. I knew you would appreciate the vintage vibe. I’ve only been to the Los Gatos store once. It’s a bit smaller but similar in all other ways. You’re the second one to mention ‘Good & Plenty’. I don’t think I’ve seen those here but will look next time I’m eyeballing a candy counter 😀 I did see those candy necklaces here, I remember once my long hair getting totally knotted up in the elastic, NOT a good thing LOL. The ceiling is really fab as is all their decor. They had boxes of ‘Candy Land’ the old board game decorating too. I loved the old illustrations from the 50’s. I took pictures but unfortunately they were out of focus, dang. I wish i could show you our local sweet shop… it has everything, even candied scorpions! Eeeeeek, that sounds totally wacko and not just because I’m a vegetarian. Maybe an interesting post for you though? Thanks for stopping in!! I didn’t think sweet cigarettes still existed! My bipeds remember having them as children. You are so welcome Boomie! Definitely a great super sweet way to end a long week! Enjoy your award! Love & hugs! Those both sound yummy too. I’ve love my latta’s and considering a machine for home since we visited San Jose. Alys’s hubby is a magician on a gorgeous barrista machine he got on Ebay no less. At the movies, we always share a popcorn (no extra butter). and diet coke. I always find popcorn in my bra when I get home LOL. That looks like the kind of shop that would be hard to leave once you were inside! I wasn’t much of a candy kid either – at the movies I always loved having a box of “Good & Plenty” though….now THAT I remember! We spent a bit of time here and then moved on to an antique shop 😀 so it wasn’t too sad to leave…hehe. I found it hard to focus on any one thing while we were here, there’s just soooooo much candy. They also sold vintage soda’s and vintage advertisements and vintage lunch boxes…all kinds of stuff. I bet it’s fun at Christmas too. It’s hard to resist a treat at the movies, we always do the popcorn 😀 Might be on the list this weekend, I can’t wait to see the new Star Trek!!!!! I’ve never had much of a sweet tooth but, put me anywhere near a supply of potatoe crisps and I’m done for. Had to visit a manufacturer of potatoe crisps a few months back and found it nearly impossible to do a presentation – my mind was wandering off everywhere else.